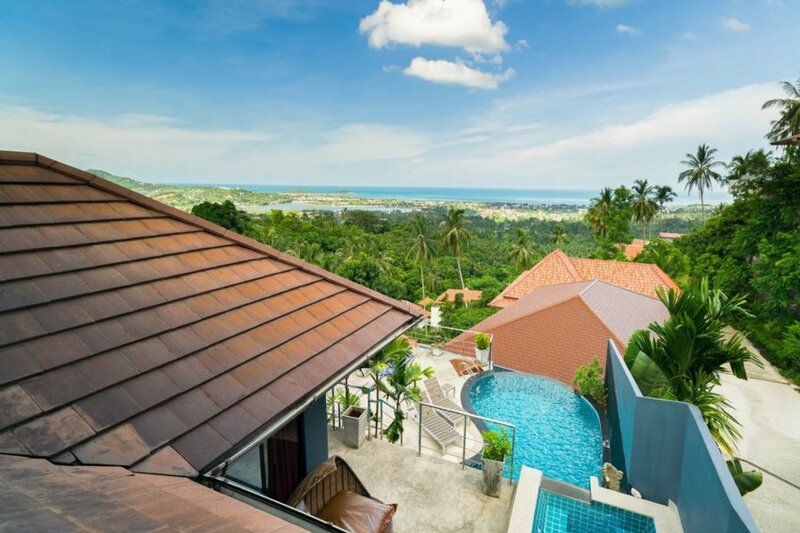 This 4 bedroom sea view villa is situated in the Chaweng Hills, in a residential estate of other villas, with security, and with stunning views of Chaweng Bay. The villa is located just 10 minutes drive from Chaweng Beach and all amenities, yet is still very quiet and secluded. It is 8 mins drive to the main ring road, Tesco Lotus, and many more shops and restaurants. Either a car or scooters are great for staying in this villa. This very spacious and luxurious 3-storey villa has 4 air-conditioned double bedrooms including a master suite with feature round leather bed, 4 en-suite bathrooms, (master en-suite with Jacuzzi bathtub and rain shower with LED lighting above), one indoor and one Balinese style outdoor shower. It boasts a spacious lounge with sensational views to Chaweng. 50 inch Plasma TV, DVD, stereo system, satellite TV entertainment, internet, dining table accommodating 8 persons and a fully fitted western style kitchen including hob, oven, microwave and large refrigerator with filtered water and ice-making machine. Through the sliding patio doors out to the 2 level ocean view terrace and jacuzzi. Steps take you down to the sun deck and private pool terrace. More steps take you to bedroom 4. Just 8 minutes drive to Tesco superstore (cinema, bowling, and shopping) and 10 minutes drive to Chaweng Beach Approx. 429sqm. of living space. An internal spiral staircase leads you to the lower floor and bedroom 4 (en-suite), and a second entrance into the villa from the covered car parking bay. The capacity can be increased to 10 guests with the use of inflatable air beds. An outdoor Jacuzzi (unheated) can also double up as a children's pool. Until recently, we built the electricity costs into the nightly rate. However, we found that air con units would be left on all day, even when the villa was unoccupied. So as an eco-friendly approach, we have reduced the nightly rates, and allowing you to pay for only the electricity that you use. The electricity meter is read on check in and check out and charged at B7.5 per unit. Average daily consumption based on 8 people sharing, would equate to B100 per person per day.